The Panthers have already turned their focus toward next year. While the 2018 season came to an abrupt ending for the Whitman-Hanson Regional High baseball team, veteran skipper Pat Cronin is not shocked it concluded the way did, and is already thinking ahead. Seeded third in the Division 2 South Sectional tournament, W-H hosted No. 14 Nauset. Unfortunately for the Panthers, they ran into Warriors ace Stephen Kalinick, who was sidelined for most of the spring, which played in to the Warriors’ then 6-12 record. However, the southpaw didn’t skip a beat, shutting the Panthers out 3-0. “People saw Nauset’s low seed and had no knowledge of their pitcher, who had had a sore arm during most of the season,” Cronin explained. “He was the reason they had one some big games early in the season, and his injury was the reason they lost their last six in a row. So, why the optimism out of Cronin after the Panthers’ second straight campaign in which they finished 15-6, which included a first-round exit in the postseason? That would be because despite the disappointing ending, just to get to 15 wins — 13 of which came in the Patriot League as the Panthers grabbed a share of the Keenan Division title for the second consecutive season — was a success in itself. On the mound, W-H was without its ace — senior captain James Dolan — for all but 1.2 innings due to tendonitis. Dolan was coming off a season in which he won six games and pitched to the tune of a 0.35 ERA over 40.1 innings en route to Keenan Division MVP honors. The injury thrust junior captain Rian Schwede into the ace role, granted he pitched like one the year prior, and he collected five wins, held hitters to a .172 average and posted a 1.64 ERA. But, Schwede was going to get his innings regardless, but classmate Ethan Phelps likely wouldn’t have. However, Phelps (also hit .300) did, and hurled 36 of them, going 3-0 with a 1.36 ERA. “Both are now seasoned veterans,” Cronin said. Both are also captain-elects, were tabbed league all-stars and are part of seven starters set to return next season. Along with his 1-2 in the rotation, Cronin will return junior second baseman Mike Cook and freshman short stop Danny Kent up the middle. Cook ranked second on the team with a .394 average and knocked in a team-high 22 runs; he was also named a league all-star for the second consecutive season and is a captain-elect as well. Kent was a diamond in the rough type of find as W-H was in need of a short stop, and he was the one to answer the bell. Junior Derek Frank is another key returnee next season, but not to his right field post, but rather behind the plate, where he’ll have big shoes to fill. Frank, who hit .291 this season, will take over for Ryan Sawtelle. Sawtelle led the team with a .400 average and was named a league all-star. “He [leaves a big hole] in many ways,” Cronin said of Sawtelle. “His handling of pitchers was impressive and constantly getting even better as the season went on. Most obvious was his hitting; he became a force this year by shortening his swing and being aggressive from the first pitch. Junior Will Newell (four RBIs) and freshman Chris Kenney (five RBIs) are the other two starters back in the fold next season. As for departures, in addition to Sawtelle and Dolan, Caleb Burke (.294 this season) — who manned the hot corner for the last two springs — and starters Korey Howard (3-0, 1.84 ERA, 19 IP) and Jason Green (3-0, 2.30, 24.1) will be missed. Whitman-Hanson Regional High baseball senior Ryan Sawtelle is making his presence felt this season. When asked of senior catcher Ryan Sawtelle’s impact on his team this season, Whitman-Hanson Regional High baseball skipper Pat Cronin didn’t hesitate one bit. Cronin even compared Sawtelle, who is in his first year starting, to a former Boston Red Sox legend. “He leads quietly,” Cronin said. “He’s kind of like a Jason Varitek kind of guy honestly. He’s that kind of a guy. While Sawtelle may be a quiet leader, he’s quietly putting together an all-star season. Sawtelle entered the week leading the Panthers, who are in second place in the Patriot League Keenan Division, with a .407 average and .514 on-base percentage. Last week, Sawtelle, who is committed to play baseball at Vermont’s Castleton University, tallied four hits and recorded three RBIs. He notched three hits and knocked in two runs in an 11-2 victory over Silver Lake Wednesday, May 9. “We just took them like any other team — take them serious and see what they bring us and we’ll bring our hardest out there,” Sawtelle said of Silver Lake. Sawtelle’s numbers at the dish may be impressive, but so is his work behind it as he directs a staff with one of the lowest ERAs in the Patriot League. Cronin described Sawtelle, who threw out a runner in the fourth inning of a 3-0 win against Hingham last Thursday, as another piece of the puzzle that’s waited its turn to fill in. Dolan said Sawtelle has been immense to the success of the Panthers, who entered the week with a seven-game winning streak and 9-1 record before a 4-2 league loss to Plymouth North on Monday, a game in which Sawtelle had an RBI double. Although Sawtelle may not be outspoken, he does have the utmost respect from his coaches and teammates. “You don’t hear a lot of out him, but when you do – you listen,” Cronin said. First place in the Patriot League Keenan Division is up for grabs tomorrow as the Whitman-Hanson Regional High baseball team kicks off a four-game week with a home contest against Plymouth North. 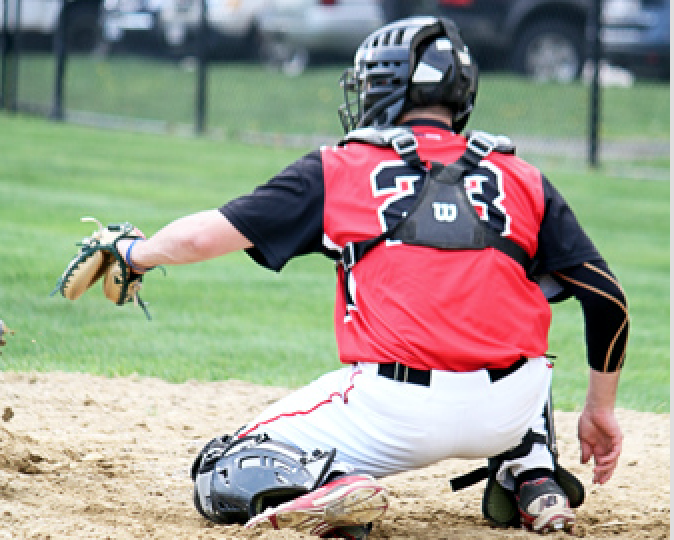 Three weeks ago, the Whitman-Hanson Regional High baseball team took a 3-0 lead into the bottom of the fifth inning against Plymouth North, only to have the Blue Eagles put up five runs — three of which were unearned — as they handed the Panthers their first loss of the season, 8-3. “We kicked a couple of balls on the turf that we haven’t kicked since,” W-H head coach Pat Cronin said. The setback occurred after an 11-day layoff due to the weather, which came off the heels of W-H opening the season 2-0. Since then, the Panthers have not lost and sit with a record of 9-1 overall and in the Patriot League as they prepare for a rematch with Keenan Division foe Plymouth North (11-2, 9-1) tomorrow. Set to toe the rubber for the Panthers tomorrow is junior captain Rian Schwede, who sports a 3-1 record and 1.84 ERA. Schwede excited the earlier game against Plymouth North with a 3-2 lead in the bottom of the fifth. “He’s clearly established himself as the ace, and that game got away from us down there in Plymouth,” Cronin said. Schwede’s emergence as the ace came after 2017 Patriot League Keenan Division MVP James Dolan exited W-H’s second game of the season — against Plymouth South — with tendentious. Dolan, who boasted a 6-1 mark and 0.35 ERA over 40 1-3 innings last spring, hasn’t thrown since, which makes the Panthers’ 9-1 start even more of a surprise to Cronin. Also logging some significant innings for the Panthers have been seniors Korey Howard (1-0, 1.97 ERA, 10 2-3 IP), Jason Green (2-0, 1.50, 14), and junior Ethan Phelps (2-0, 0.44, 16). “I know what they’re capable of and having coached a long time you can project into the future what is their possibilities — what is possible if they work hard, so on the other side they never really surprise me either,” Cronin said. At the plate, senior Ryan Sawtelle is hitting at a .407 clip to pace the Panthers. “He’s another guy that’s been there for three years with us and he’s worked his way through” Cronin said. The Panthers’ most recent victory (3-0 over Hingham last Thursday) marked their seventh victory in an eight-day span. 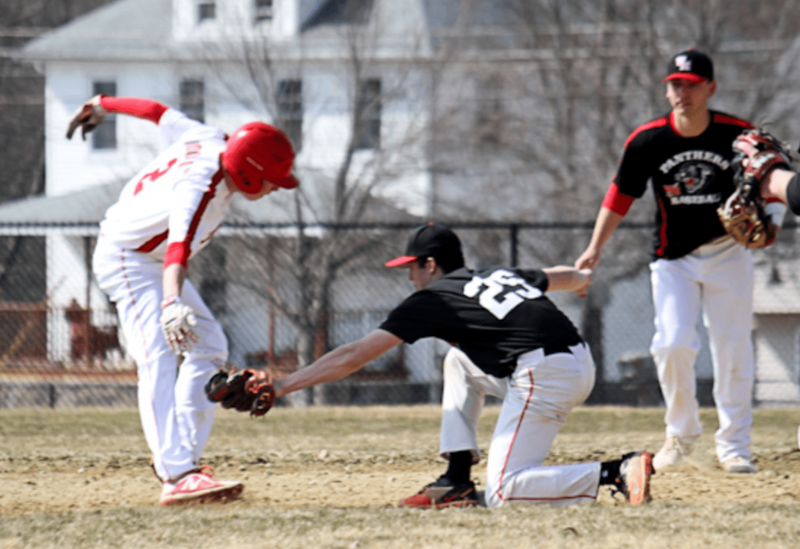 Other victories came over Quincy (13-1 on May 2), Pembroke (6-0 on May 3), Hanover (3-2 on May 4), Duxbury (5-2 on May 5), North Quincy (7-5 on May 7) and Silver Lake (11-2 on May 9). Cronin said keeping his players fresh and not overworked is a constant battle for him. Cronin said he tries to keep his practices in the range of an hour and a half to at most two hours during the heart of the season. After tomorrow’s tilt with Plymouth North (4 p.m.), W-H will travel to Brockton to play the Boxers (9-3) on Tuesday, before returning to league play as it visits Duxbury (5-4, 4-4) on Wednesday and hosts Quincy (2-9, 0-8) on Thursday. It’s been a hectic few months for Ethan Phelps, a junior two-sport athlete at Whitman-Hanson Regional High. It was directly after the conclusion of the Whitman-Hanson Regional High baseball team’s 7-5 victory over North Quincy on Monday, Ethan Phelps — still in uniform after knocking in the game-winning run — hurried up to the high school to write teacher appreciation notes as part of his National Honor Society duties. That is just a glimpse into what has been a jam-packed few months for the junior. On Saturday, it was much of the same for Phelps, who roams center field for the Panthers. After taking the SATs in the morning, it was straight to the baseball field for an afternoon tilt against Duxbury. For Phelps, it’s a good busy that stems from his dedication on and off the field as a multi-sport athlete. It was at the outset of his sophomore year when Phelps was in a quarterback battle to assume the reins under center for the W-H football team. Since then, he has accounted for 56 touchdowns and helped guide the Panthers to back-to-back playoff berths. His talent on the gridiron — which has been assisted by hours of work in the weight room — along with his 4.2 GPA, are two traits that landed Phelps the MIAA Student-Athlete of the Month Award in November. They’ve also earned him some high-level college football visits. All within a two-month span, Phelps toured Williams College and Bryant University, along with Ivy League schools Dartmouth and Harvard. On the diamond, Phelps and the Panthers are in the midst of the heart of their season, fresh off a five-game week that began April 30. Phelps took the ball last Friday for his first career start and hurled eight innings of two-run ball as W-H knocked off Hanover, 3-2. Phelps tossed 83 pitches — 67 for strikes — in the extra-innings win. The next week doesn’t get any less chaotic for Phelps, with three advanced placement exams, a college visit to Middlebury and four baseball game on his docket.